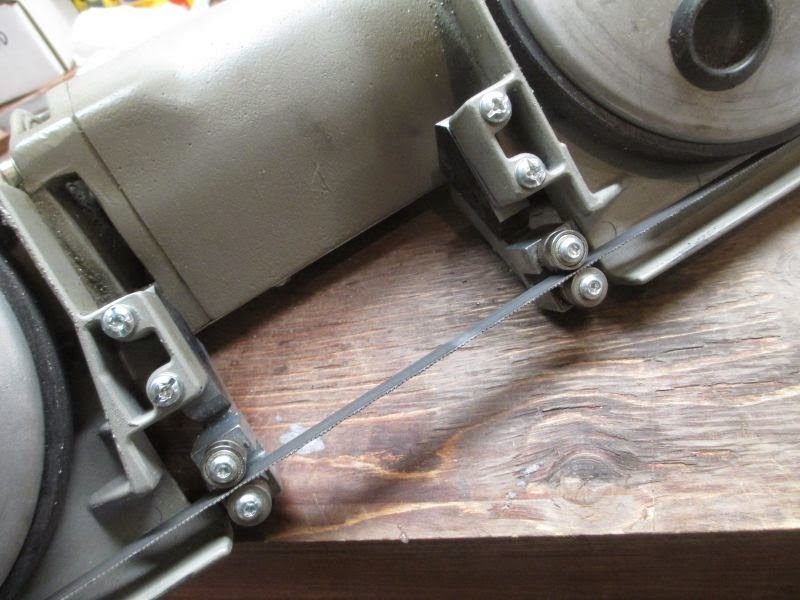 As a long time member of the hack saw club I reckoned it was time to get a band saw for metal. 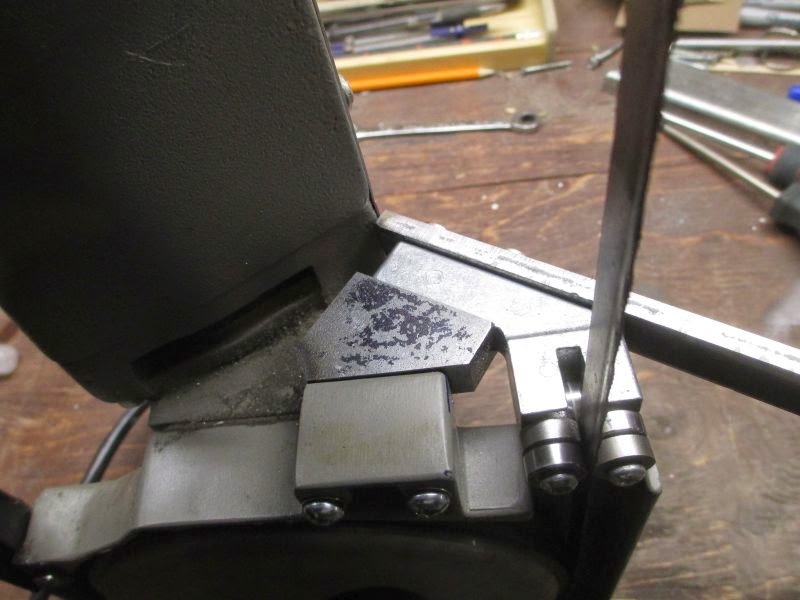 I had looked at some rigs that other knifemakers were using and was intrigued by the idea of mounting a portable band saw on the bench and making a little table for it. What brand of saw to buy? 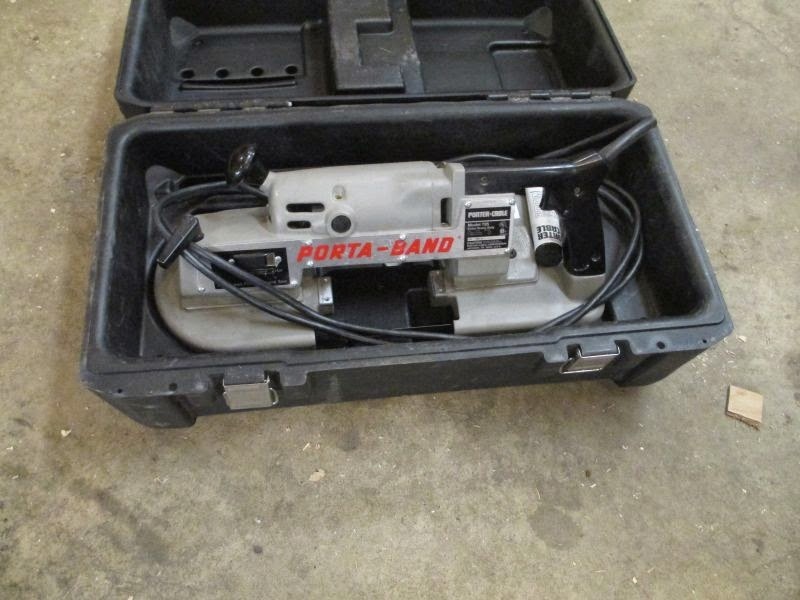 Typically, common names like DeWalt and Milwaukee are sold second hand for the $100 to $200 range. 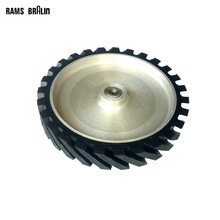 These use a common size 44-7/8" x 1/2" x 0.020" blade. Having the same blade size makes buying replacement blades (pardon the pun) a snap. 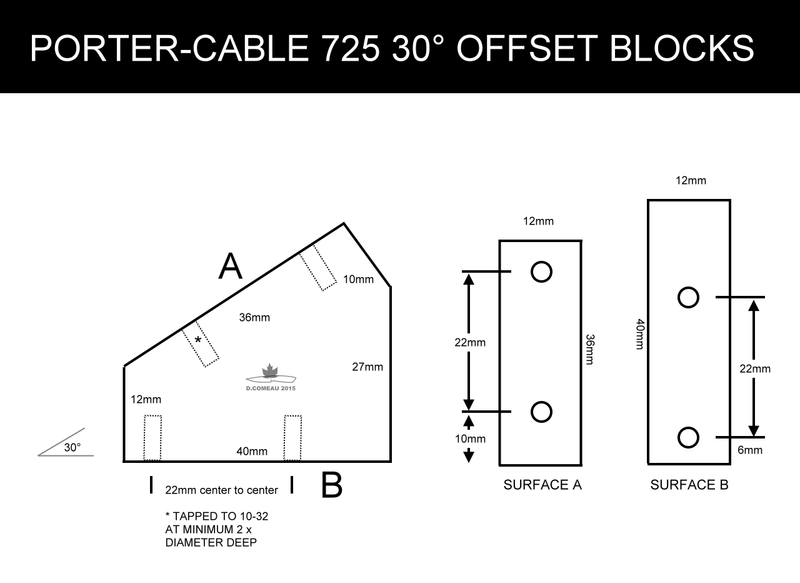 As I was waiting patiently scanning the offerings on the classified sites, then heavy-duty Porter-Cable 725 came up for sale, I jumped on it. The 725 is not a perfect portable band saw for mounting, but it's hard to beat for build quality and over all robustness. The first thing I noted about the 725 was that the cutting capacity was severely limited by the angle of the blade. 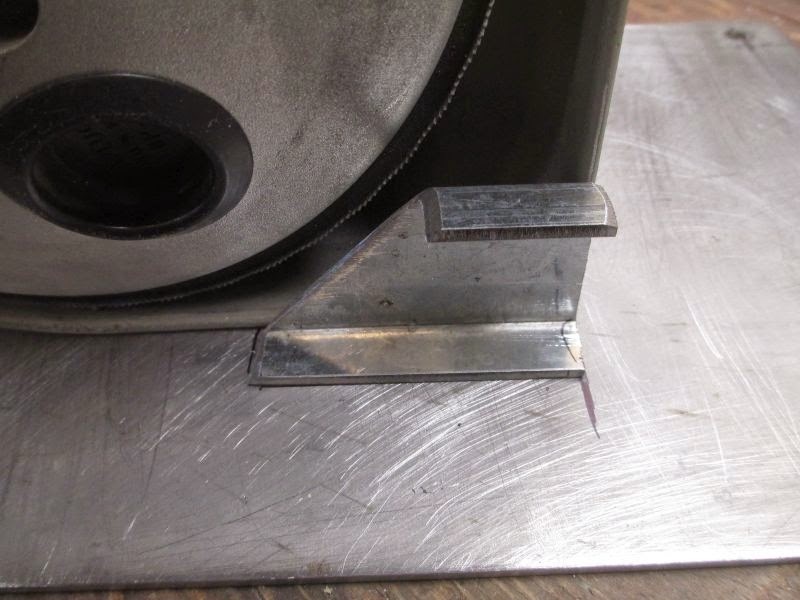 The blade gets tilted about 30° by two sets of rollers. This keeps the blade straight up and down when holding the handles. In the bench mounted mode, I could re-position these guides to allow for very long pieces of steel to be "ripped" as the item being cut would miss the saw motor frame. 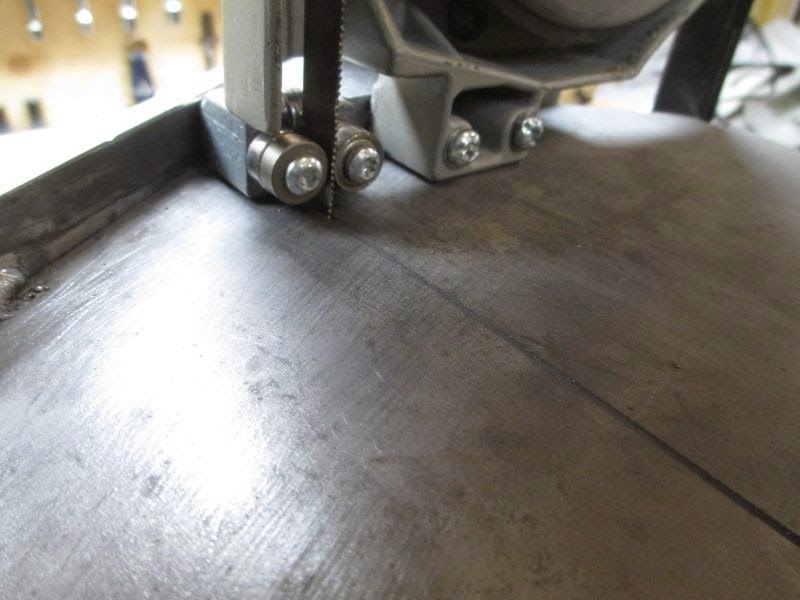 Here you can see how the original 725 blade angle allows for good cross cutting, but poor ripping. As a knifemaker, I am more likely to be cutting long rip type cuts. The blocks will change the angle to accommodate this, while sacrificing the cross cutting capacity. If I want to rip something longer than 4", these little guys have to change. I came up with something by playing with the guides and seeing how they can be tweaked. My solution is to make a block to bring the guide back to 0°. Here is my test wedge made of hardwood. In-situ, this looks like it is going to work. Now to make two of them out of 1/2" steel. Here's my two blocks ready for drilling and tapping. These don't have to be 100% exact as there will be some wiggle room given the hole sizes. It's important to note that there is a trade off with the angle of the blade. 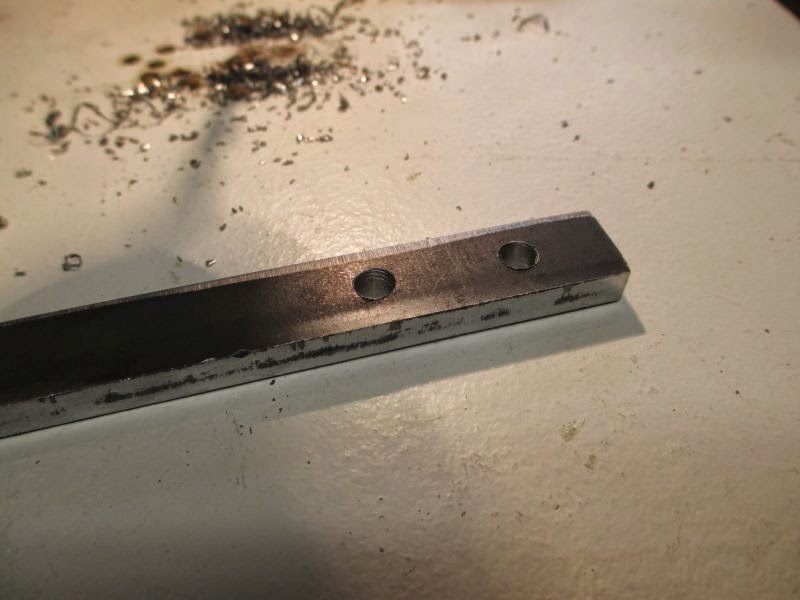 The factory angle will let you cut a piece off of a very long piece, but it is limited to about 4" in depth. The angle of my blocks will let me "rip" very long pieces but limit the length of cuts to about 6". Some angle less than 30° may be best for you, depending on your applications. I drilled all the holes to 5/32" on the drill press. I went deeper than required to ensure that I have at least a good 1/2" of threads to catch on. I tapped with a hand tap and some cutting fluid. 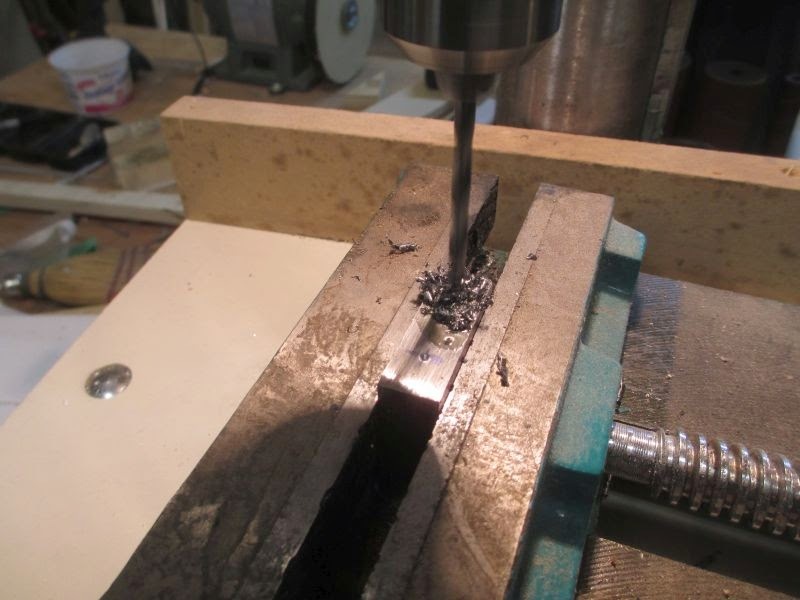 I had to drill out the original holes to allow the 10-32 to pass through unimpeded. The body is aluminum. 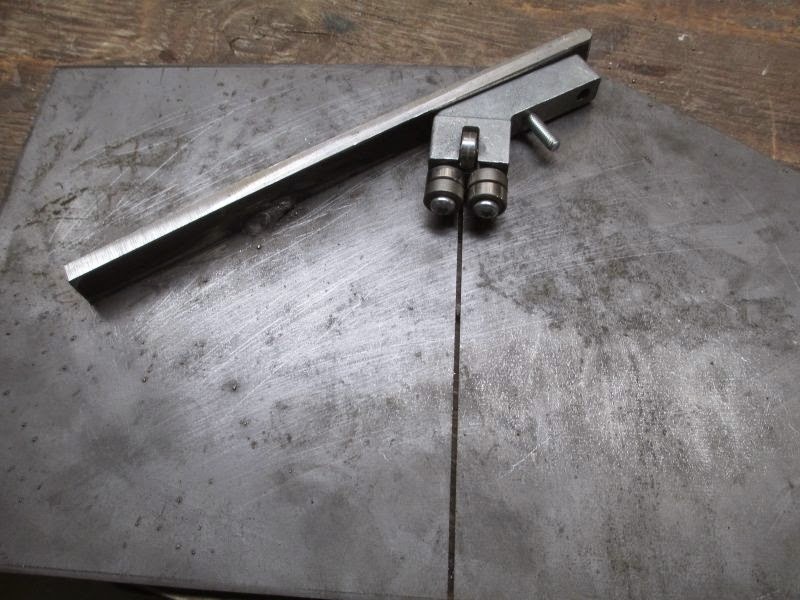 The blocks and guides are installed with 10-32 x 1-1/2" (QTY 4) , 10-32 x 3/4" (QTY 2) and 10-32 x 1" (QTY 2). 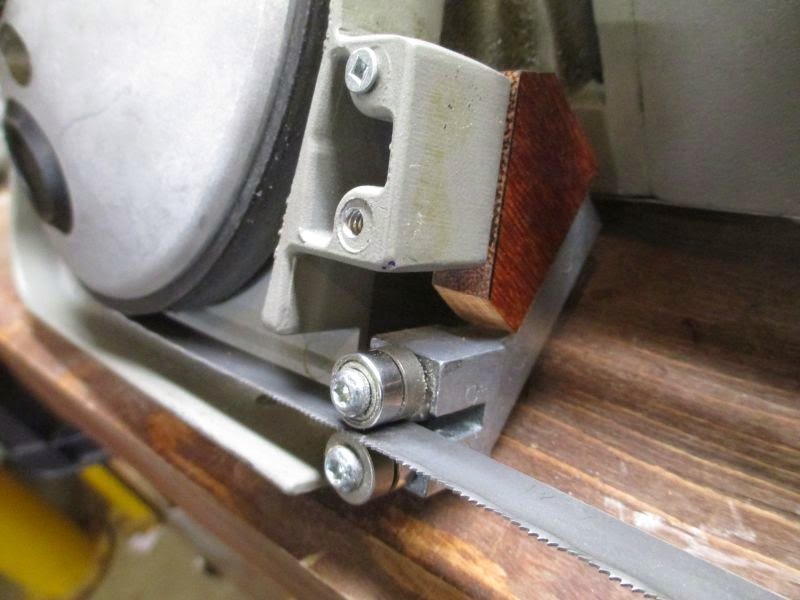 The 1" screws are for back of the lower guide where an additional 1/4" is required to mount the table cleat. For the table cleat, I used some scrap 1/4" flat that was about 5/8" and 6" long. I drilled two 3/16" holes 7/8" (~ 22mm) apart for the mounting screws to pass through. 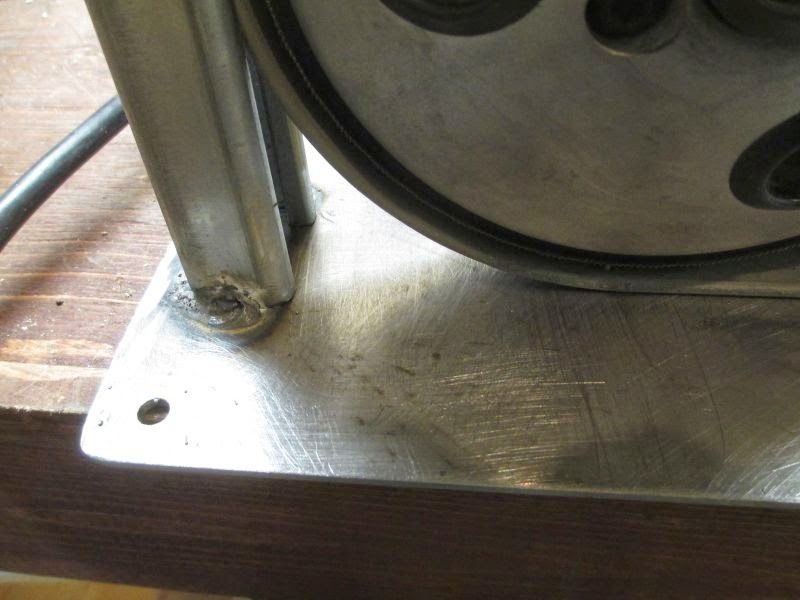 The table will be attached to the cleat with a few welds once it's all lined up. 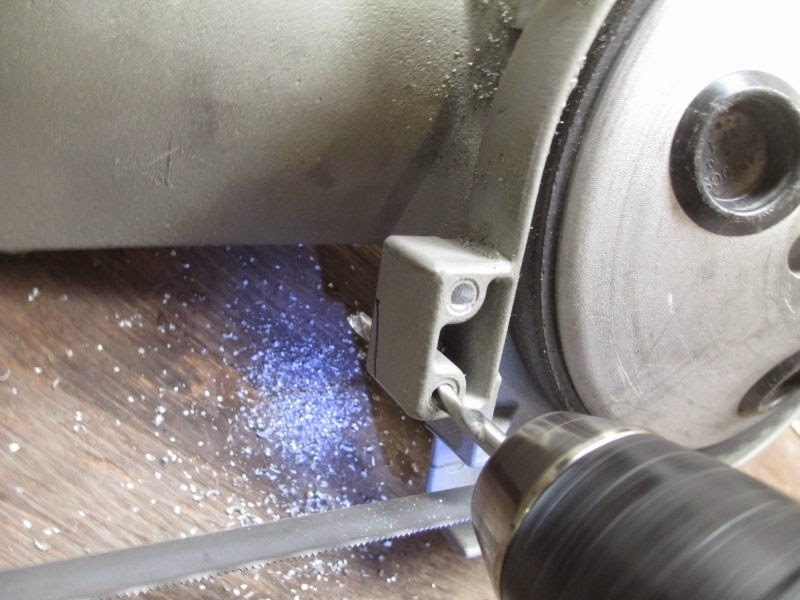 The table cleat will allow the table to be fixed and rest on the frame at the same time. This will allow use to adjust the table a little bit so it's 90° to the blade. 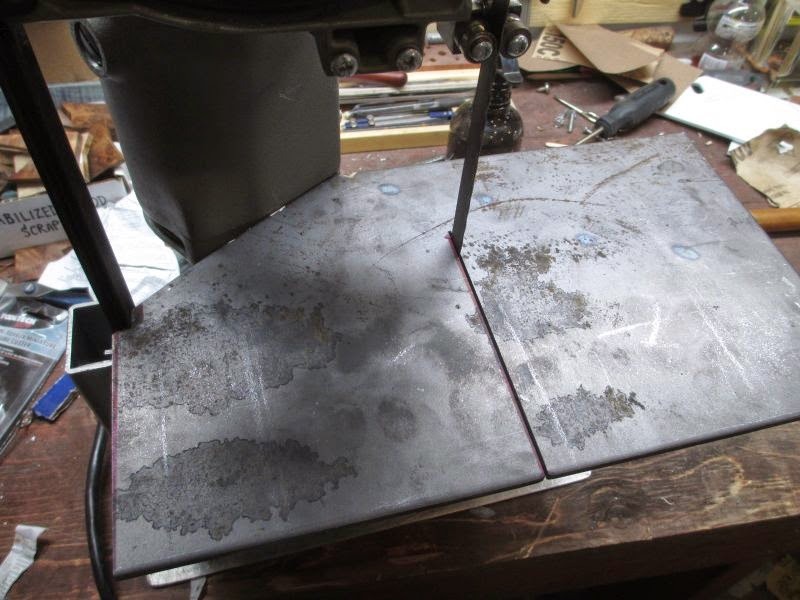 The table top is made from 3/16" cold rolled steel that I cut on a large band saw. 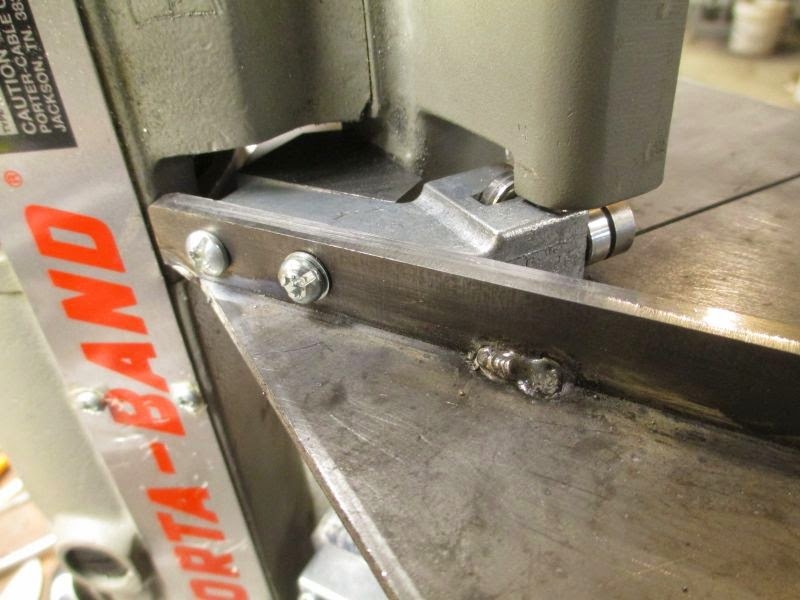 The blade on the big band saw is thicker than my little 0.020" blade so the slot will work just fine. 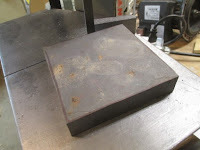 I welded the cleat to the underside of the table after positioning it and marking it. The underside of the table looks like this when screwed down. Another view of the underside from the back of the saw. My base started with a piece of 1/8" steel about 12" x 7-1/2". Anything you have handy will do as long as it's flat and fairly square. You could make a base out of plywood and that would probably work just fine. We're not going to be working the saw too hard. I drilled four 5/16" holes in the corners for mounting. Here attached some shallow strut. The saw frame fits nicely into the strut. On the right side I added a stop to the front. Note that I want to be able to change blades without removing the saw from the frame so the channel is cut at a 45 to accommodate this. 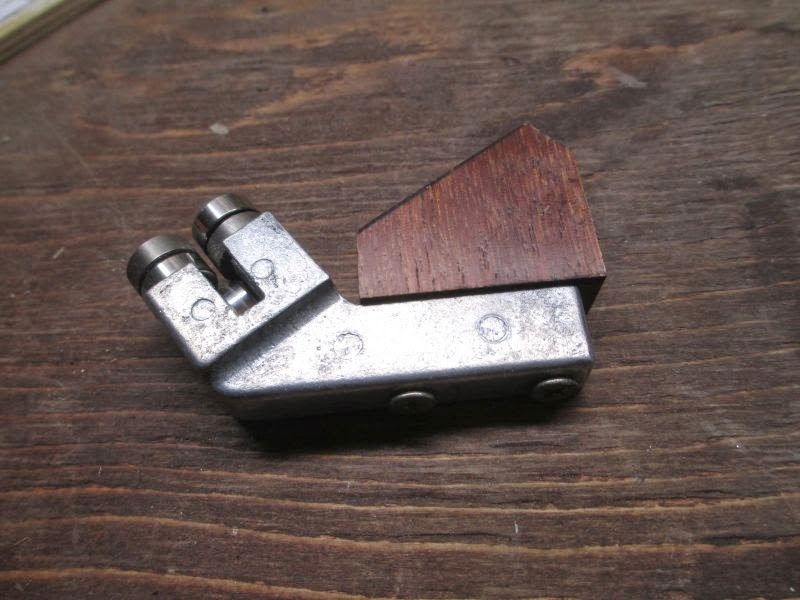 I had a piece of 1" angle and used this as the right-side vertical member. I made it the same height as the table cleat. This piece will also help in supporting the table. I added another 2" section of 1" angle to the back of the base. 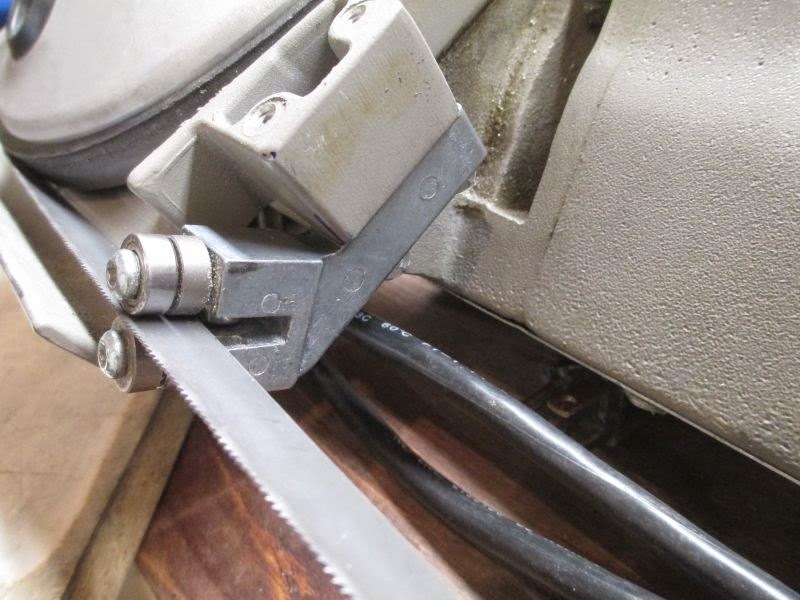 This is where the handle of the saw sits and forces the saw forward into the vertical supports. 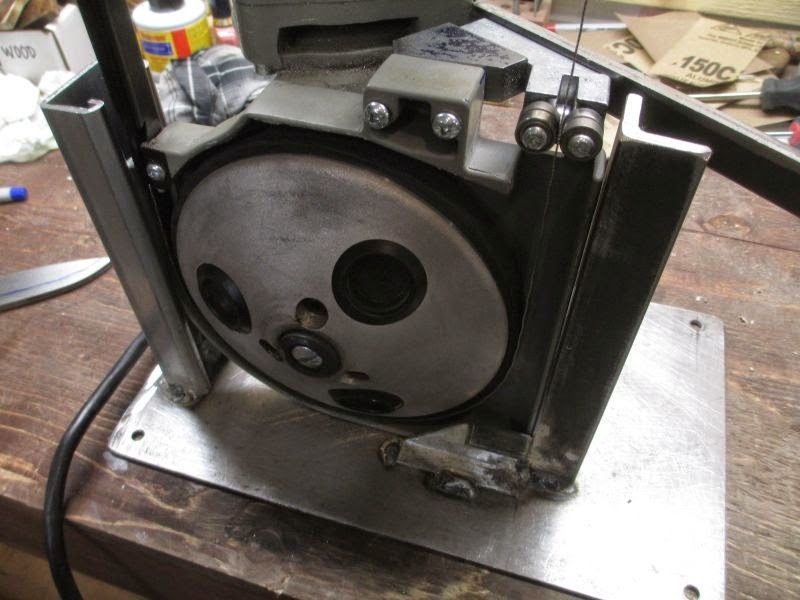 Here we see the saw installed into the base. Here it is before paint. I will paint the base and tie up the power switch so that the saw stays on when powered. This leads us to the switched receptacle. I have to say, this thing is one of the most useful things in the shop. I used it almost everyday. I've cut tubing, lots of stainless cutlery stock, heavy bar stock and 3/4" high-carbon plate steel without any problems. The blades seem to keep going forever when I run it at the slower speed. 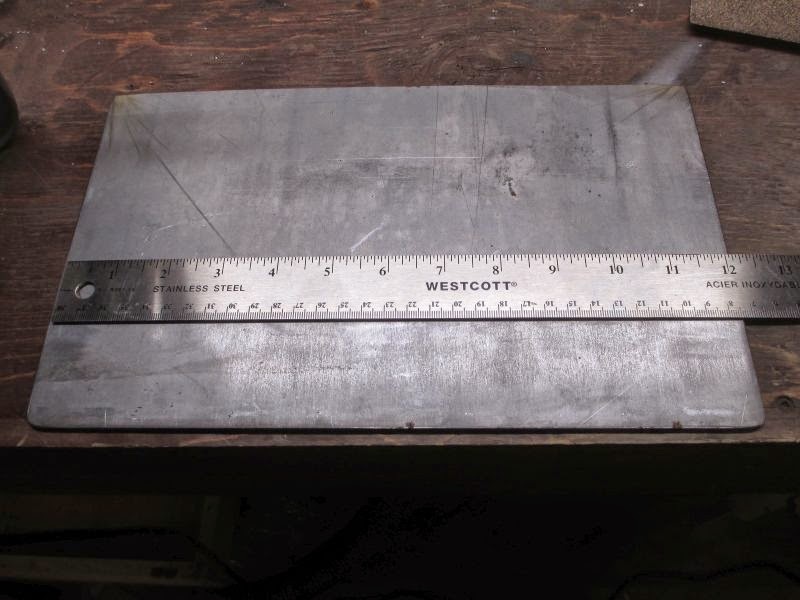 Here is the high-carbon 3/4" plate steel. It took a while, but made it through with an 18 TPI Milwaukee bi-metal blade. After having gone through some blades already, I can say that I am a fan of LENNOX. Good value blades. Still working well and still gets plenty of use. Please note that this article is intended to be only educational in nature. The author and/or publisher assumes no responsibility for use this information. Always consult with a qualified electrician and adhere to codes set out by your national and local electrical authorities. To make the power switch I salvaged a heavy-duty power cord (14AWG wire) and picked up some bits & pieces at the hardware store. A BC1110 box, receptacle plate, switched receptacle, cord strain relief and seven blue fork lugs. This is the basic wiring of a combo switch receptacle. There are two ways this can be used: 1; the receptacle is always powered and the switch controls something else, say a light, that is NOT plugged into the receptacle, or 2; the switch is controlling the receptacle. We want the switch to control power to the receptacle. Remove about 5 inches of the jacket from the power cord. Pop one knock-out and install the cord strain relief. I like to do that at the end, opposite to the grounding screw as shown. As the receptacle will be switched, you must break the tab between the switch hot and receptacle hot like shown. Make a small 14 AWG jumper, about 3" long, strip about 1/2" of insulation off and crimp a fork lug on each end. 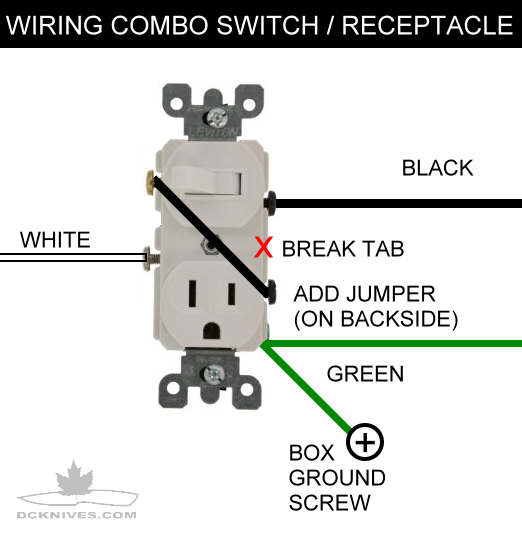 After breaking the tab, connect the jumper between the switched hot and the receptacle hot. Make a 6" jumper wire from 14 AWG green. Strip and crimp two fork lugs. This will be for bonding the receptacle to the box. Now strip and crimp lugs on the three (black, white & green) wires from the power cord. Connect the white, black and green wires. When connecting the green wire, add the green jumper wire as well. See photo. Push the cord back into the strain relief and tighten it down to secure the cord. Orient the receptacle for your purpose. (The wires are long enough to allow you to turn the receptacle around.) Remove and cut the one screw that will impact the cord strain relief. I cut this screw down to 1/2". Tighten down and attach the plate. Plug it in and check with your receptacle tester. I just built a table for my porta band today and notice I would need to change the blade angle ... and stumbled across this post! Thanks again for your willingness to share! Not a problem Frank! If you have any questions let me know.